With the sun making an appearance over the past couple of days, it has really got us in the mood for summer. Sunbathing in the garden, having BBQ’s with friends, playing out with the kids and just generally enjoying being outside is pretty much all we’ve thought about. Now our artificial grass is already installed in our garden and ready for the summer sun, but is yours? If you’ve not got a great garden and are looking for a hassle-free way to look summer ready in a flash, then artificial grass is the way to go. Seeing as summer is on its way, we thought now would be a great time to talk to you about our 30mm Natural Summer artificial grass. This type of artificial is the medium pile height product in our range and is manufactured to look like a healthy natural lawn. This is done by using naturally coloured blades of artificial grass to make sure the lawn doesn’t look like “fake” grass. No one will be able to know the difference; not when they look at it and not even when they walk on it. Sneaky! 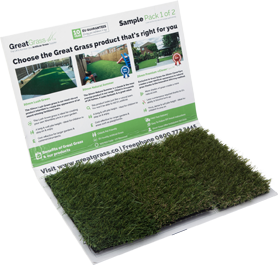 So let’s take you through the make-up of this particular type of artificial grass. We’ve already mentioned that the Natural Summer range is the medium pile height so it has long artificial grass strands. We use two different green shades of synthetic grass blades in each strand to make it look natural. Also in the mix are separate curly green blades and a tan thatch to really fool the eye into thinking it’s a natural lawn! When it comes to artificial grass, we really know what we’re doing. Natural Summer artificial grass captures the essence of a natural lawn all year round without the mud, the mess or any mowing. You also don’t have to worry about watering as it won’t dry out, meaning you’ve got more time and energy to actually enjoy the summer! We don’t get many days of sunshine in the UK so we need to make the most of them! For more information on our Natural Summer artificial grass please get in touch today.